This is a great example of how NOT to promote your business on TV. 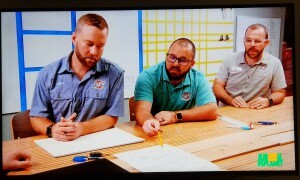 The Pratt Guys collaborated on Season 3 Episode 3 of Animal Planet’s Insane Pools: Off The Deep End with Lucas Congdon. “Pratt Brothers” is mentioned 16 times in a 5 minute period near the beginning of the show, along with 3 shots of their sign/logo on the doors and building as well as the three brothers wearing branded logo shirts. That’s more than three mentions a minute, about 1 mention every 18.75 seconds. The first 3 or 4 mentions are very natural in conversation and are needed for the narrative. That would have been perfect with the logo shots on the door, their branded shirts and the examples of their work shown in the episode. The next 12 mentions are total overkill and a pushy turn off. The over-promotion and gratuitous mentions make the show feel less like entertainment and more like advertising…or a drinking game. This episode is very different from the typical episodes with stories that flow naturally. Did the Pratt Brothers pay to be on the show? I don’t know. Either way, it sure feels like an infomercial. By the end of the show, my final tally is 29 “Pratt Brothers” mentions during a 48 minute show. That’s 24 more times than Lucas Lagoons, the star of the show. People go on TV (and create videos) to promote their services and products.There’s a delicate balance between promoting your business and keeping viewers interested, engaged and entertained. If content feels like promotion, it’s a turn-off for viewers…literally. When viewers are turned-off, they don’t watch you, inquire about you or they don’t hire you. When you over-promote, there’s decreased return on all the time, energy and expense that went into the TV appearance.